We are pleased to launch our association’s website and post our very first article to our blog. On these webpages you can easily find information about who we are and what we aim to do. In the About us section you can find more information about our mission as well as history of the association. In our Projects section you can read the up-to-date information on our past and ongoing projects. We want to be transparent about our aspirations and objectives and hope you also check the volunteering opportunities in the Get Involved section. We wholeheartedly welcome new volunteers on an ongoing basis. We have a chance now to underwrite history for Finland we and future generations can be proud of. In this blog we will share articles regarding asylum and refugee related phenomena both in Finland as well as internationally. We live in an interconnected world and we cannot only approach these issues on a national level. Many issues in migration, its challenges and opportunities, are highly contested, which is why disseminating information that has been validated by proper (peer-reviewed) research becomes crucial. We believe that in times of disinformation and fake news, quality research and articles have the power to sort out facts from mere opinions. When we talk about asylum seekers and refugees, must be noted that we often talk about matters of life and death. We encourage policy makers and the media to approach the topic with the integrity and seriousness it deserves instead of making hasty conclusions. 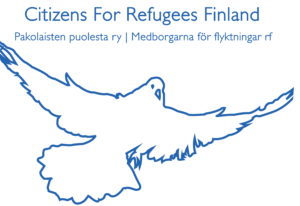 Citizens for Refugees Finland team hopes you find our blog and articles informative and you will stay tuned as we monitor the field, advocate for refugee rights and unite people to tackle challenges together.